I recently returned from a long weekend away to attend and help host my twin sister’s baby shower (she’s having twins!!!) and see my family. I will post later about the shower, but I thought I would do a post series about my family and food. Let’s start by going back. 1. Asparagus casserole. My mom went through a casserole phase. This was by far the worst. We still give her a hard time about it. 2. I used to make lunch every week in the summer when I was in middle school for Marge and Shirley, our house-keeper and babysitter. 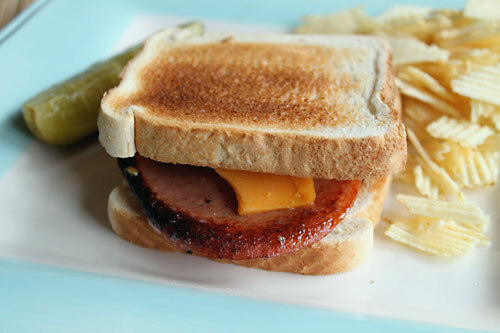 I perfected the fried bologna sandwich and made some killer skillet potatoes. 3. Allison and I used to make cookie dough without the egg so we could eat it as cookie dough. This may or may not have contributed to our pre-adolescent heaviness but at least we were conscious of avoiding salmonella. 4. Brendan and I started a new Christmas Eve tradition three years ago. When we get home from the midnight service, we make a pot of peppermint hot cocoa. Whole milk and William Sonoma hot cocoa make the best combination. My dad got me some for Christmas this past year, so I’ve been having it year-round! Whipped cream on top, of course. Target’s mint cocoa is delicious, too. 5. When Allison and I were in high school, we had a foreign exchange student and good friend stay with us for a year. That Christmas, we baked 700 cookies, all different kinds, to give to friends, family, and teachers. We tried all sorts of new recipes. 6. One thing I remember the most about baking with my mom was how good she was at scraping out batter from a bowl. She always let us lick the bowl, but only after she got most of it out. I do the same for my kids now. 7. Banana nut bread. My mom’s mom’s recipe is a family staple. And my mom makes the best banana bread using it. Long thin bread pan and all. 8. My dad is the leftover master. He can put all sorts of things into a skillet and out comes a yummy remix. When I was just in Virginia, I tried a veggie dish he put together…so hearty, and so good! 9. When we were young and visited family – Grandma Toni’s house or my Aunt Barb’s house in particular – I remember sitting around the kitchen table and talking while food was being made. I love that cooking was the activity we gathered around, the kitchen that warm place of conversation and connection. 10. A couple of years ago, Shawn and I spent Thanksgiving in Gainesville. We celebrated the holiday with Riley, baby Adrian, and the two of us. But despite the low number of eaters at the table, we still produced an amazing spread. We spent all morning and afternoon in the kitchen, and the meal lasted maybe twenty minutes. We ate six course leftovers for a week. Now that the kids are getting a little older, I get them involved in meals and food prep as much as possible. They have their aprons. They take turns dumping ingredients into bowls. They love to lick the bowl. Riley can even operate my Kitchen Aid mixer, and she is getting better at cracking eggs and leveling dry ingredients in measuring cups. They help set the table. We ask their in-put (a little) on what to make for lunch and dinner. I hope to fill their childhood with strong and positive memories about food and cooking and baking. Food has been a strong adhesive in my relationships with my parents, and I hope it will be the same for my kids. Stay tuned for Part 2. We made so many good dishes and desserts while I was just home, enough to fill an entire blog post! Yes, this post is actually about squash. 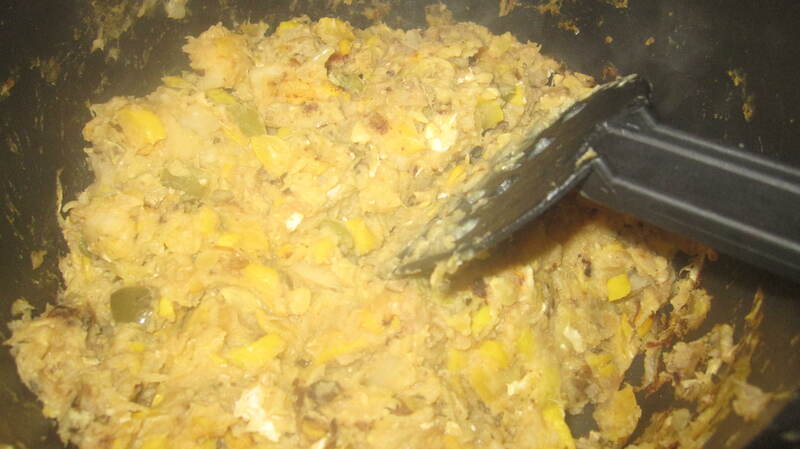 The vegetable, but also a dish my grandma used to make when we would visit. And I suppose this post is also about the way foods inform our lives, but maybe not. In our basket two weeks ago, we got four yellow squash. I had just made and frozen a squash casserole, so I knew I wanted something different this time. Really, I wanted squash the way I best knew it: Grandma-Toni-style. On Monday, the squash were screaming to be used. I started to slice. I called my dad to go over ingredients and directions again to remember how the dish comes together. Talking about the dish brought me back to my grandmother’s kitchen, its round table, the toaster oven, the Portuguese bread sitting on top of the microwave, the skillet sizzling with chicken cutlets and squash. 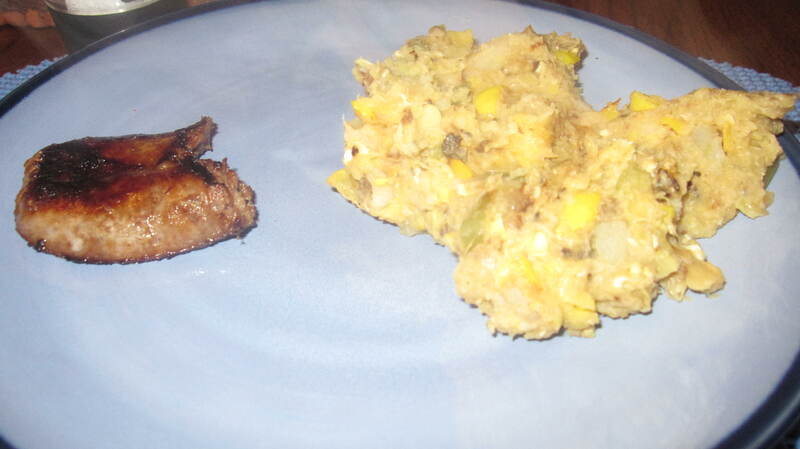 The staple ingredients are squash and potatoes, cut thin and cooked until soft. You can also add onions, green peppers, celery, and scallions. I had an onion and green pepper on Monday, so I threw those in, too. Seasonings are key and can also vary: I used garlic, basil, oregano, and some salt and pepper. Once the veggies are soft and seasoned, the last step involves an egg or two. I used two, just cracked them on top and stirred until incorporated and cooked. The egg really brings everything together. And that’s it. Pretty much the heartiest, home-style side dish I’ve ever had. It turned out pretty good on Monday, too. I plan to have the leftovers for lunch today. The dish brings me back to childhood trips to New York and college weekend visits to Rye. I remember dinners of breaded chicken pounded thin, manicotti, squash, ambrosia, sometimes liver and onions. Full dinners. Loud dinners. I remember long nights sitting at the kitchen table while my grandma continued to prepare something for us, a cup of tea, dessert. I don’t think she ever sat down. I remember talking about boys and school and the changing world and the weather, and not wanting to go to bed. I remember falling asleep in the family room, so cozy and warm and already looking forward to morning with its promise of fresh cups of tea, toast buttered with Breakstone butter, and grandma bustling around, attending to us, first and always. I hope Grandma Toni knows how much those meals, those moments meant to me. I hope we will get the chance to visit soon, to return to that house, that kitchen with our three kids. I hope someday my kids will actually like eating squash (the dish), and I will get the chance to tell them how it has been passed down through the generations. Maybe they will make it for their kids. Maybe I will make it for their kids. It’s not a pretty dish, and really there is nothing special about it: no special ingredients or procedures. But perhaps it is the dish’s simplicity that makes it mean so much.